The last week of January 2013 marked the 30th anniversary of the repose of His Grace, Bishop José [Cortes y Olmos], of Mexico City, the first Bishop of the Mexican Exarchate of the Orthodox Church in America. 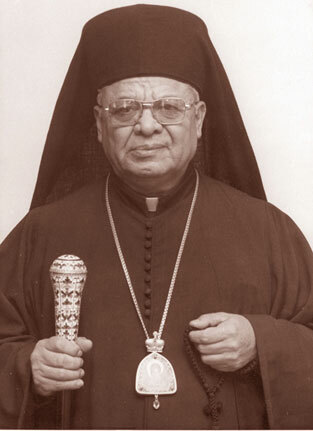 Bishop José fell asleep in the Lord on January 28, 1983. He was born on August 5, 1923, in Santa Teresa, Guana Juato, Mexico to devout Roman Catholic parents. He began his primary education at the age of eight in the Santa Teresa Rural Federal School. Upon completing his middle and seminary educations in Jesuit schools, he was sent to Barcelona, Spain and Rome, Italy for further theological studies. He received a Doctorate in Canon Law. He then went to Havana, Cuba, where he taught at the Jesuit College of Belen and served as a leader of “Catholic Youth Action” while serving local Roman Catholic parishes. Dissatisfaction with the Church of Rome led to his break with it in 1950, at which time he joined the Mexican National Church. In 1961, he was elected to be its bishop. The origins of the Mexican National Church as a church, distinct from the Roman Catholic church of Mexico, are connected to events surrounding the Mexican Revolution. At that time, antagonisms against the Roman Catholic Church were aroused by its historic association with the Spanish colonialists. Some of the first laws of the new Mexican Republic were antireligious. In 1917, all church properties were nationalized, many churches were closed, monasteries were abolished and the communities dispersed, and clergymen were required to obtain licenses to function. Several attempts were made to establish a “national church.” In 1926 a Roman Catholic priest, with government support, was made head of the Independent Old Catholic Church of North America, and the Mexican National Catholic Church was founded. The independent group thrived under the patronage of the government and at once extended its jurisdiction to Mexican communities in Texas. The National Church continued as an Old Catholic community until the future Bishop José, while still a priest, was appointed its bishop in 1961. He and his clergy gradually became convinced, through study and reflection, that the Old Catholic ecclesiological principles did not conform to the criteria of the One, True, Catholic Church. They came to identify with Orthodox Holy Tradition, and adopted the designation “Orthodox”—Iglesia Ortodoxa Catolica en Mexicao (Orthodox Church in Mexico). In 1965, Father José and his clergy contacted the then rector of Saint Seraphim Church in Dallas, Texas, Father [later Archbishop] Dmitri Royster, who had been instrumental in converting many Mexicans to Orthodoxy and was translating Orthodox liturgical services into Spanish. Archbishop Dmitri presented the case of the Orthodox Church in Mexico to the hierarchy of the OCA. After a number of exchanges and visits, the Holy Synod sent Archbishop Dmitri to visit Mexico officially and to report on his findings. This report was studied by the OCA’s Department of Canonical Affairs, which recommended acceptance of the Mexican communities into the Orthodox Church. In 1971, he and the other clergy of his community petitioned for acceptance into the Orthodox Church in America. They were received in their Roman Catholic rank as priests. Father José studied at Saint Vladimir’s Seminary prior to his consecration as Bishop of Mexico City, which took place at Holy Virgin Protection Cathedral in New York City on April 22, 1972. On January 28, 1983, Bishop José fell asleep in the Lord after a relatively short bout with cancer. May Bishop José‘s memory be eternal!